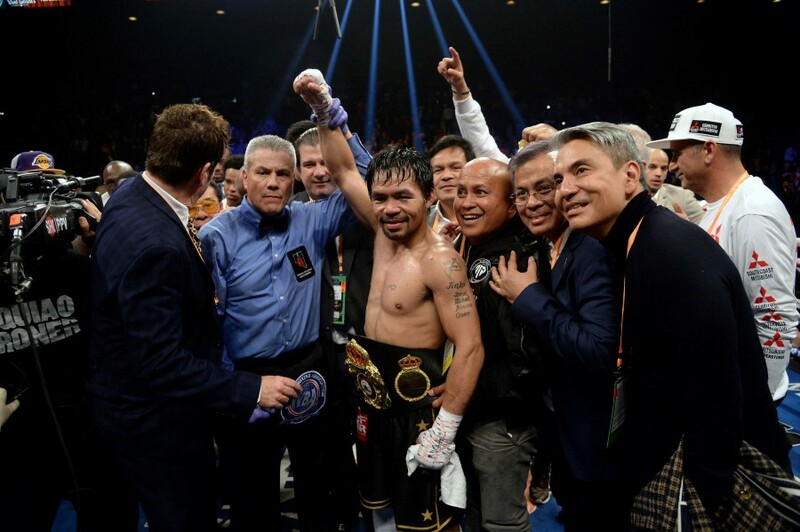 LOS ANGELES: The eye injury Manny Pacquiao suffered in a unanimous-decision win over Adrian Broner is a scratched cornea, and the Filipino ring icon is already on the mend, a spokesman for Pacquiao’s camp said Monday. The New York Daily News had reported that some in Pacquiao’s camp feared he had suffered a potentially career-threatening detached retina in beating Broner to retain the World Boxing Association “regular” welterweight world title – the lesser of two WBA welterweight belts to that of unbeaten US “super champion” Keith Thurman. In fact, the 40-year-old fighter had already shed his eye patch and was feeling fit enough to attend Monday night’s NBA game between the reigning champion Golden State Warriors and the Los Angeles Lakers at Staples Center. But the eye injury – possibly caused by loose tape on Broner’s gloves – wasn’t the only bad news for Pacquiao in an otherwise productive weekend. A Los Angeles home owned by Pacquiao was burgled while he was in Las Vegas, sources said, but it wasn’t immediately clear what was taken. It’s not the first time a prominent sportsman has had a home burglarized in Los Angeles. “I will ask my promoters who’s next and we will announce that in proper time,” promised Pacquiao, who said he would be more than willing to climb into the ring again with Floyd Mayweather in a bid to avenge his 2015 loss to the undefeated American which became the richest one-day sporting event in history.